My skin is quite sensitive, combination skin. It doesn’t take much to set it off. I have what can only be described as diva face, and I pretty much live in fear of it’s dry and oily rage potential. With my skin, trying to keep it clean and calm is the focus. Cleanser is probably the product I am least likely to experiment with because it is the basis of a good routine. Without a clean base to start from, none of your other products can work to their full potential. I have tested this product for a few months now, and so I am confident that I can give an honest review which won’t throw your routines into turmoil. La Roche-Posay is a brand I am already familiar with for their range of products for those with extremely dry skin. La Roche-Posay is a French brand, and I have always found their products to be of a very high quality. Specialising in sensitive skin, La Roche-Posay products are infused with antioxidant active thermal spring water which heals and soothes inflamed skin. The science behind their skin care is very real and supported by dermatologists world wide. I would encourage anyone interested in skin to take a look at their website as it is very informative. Needless to say, when I came across a face wash made by them for what sounded like my skin type, I was delighted. Gentle cleanser and make-up remover for normal to combination sensitive skin. Suitable for waterproof make-up removal. Non-comedogenic. The Physiological Cleansing Gel has the ability to gently removes make-up from normal to combination sensitive skin. Suitable for waterproof make-up removal. Non-comedogenic. Physiological Formulation Charter: – cleansing agents selected for optimal tolerance, high make-up removing power, moisturising, soothing agents with La Roche Posay thermal spring water, – physiological pH, soap-free, alcohol-free, colorant-free, paraben-free. The consistency is a light gel. It doesn’t foam, and so it can be tempting to use too much if you are accustomed to foaming cleansers, but a couple of pumps is more than enough. It gives that lovely deep clean feeling that so many milky sensitive cleansers lack. After a double wash, I have no doubt that not a molecule of dirt remains. I do tend to get blocked pores and spots, so the fact that this wash is non comedogenic is really important to me. Thanks to the thermal water, it doesn’t dry. Although skin is squeaky clean, it’s also soft and hydrated feeling. Since I have been using this wash i have stopped getting dry patches and redness on my face. What I really loved about this wash was that there was no ‘settling in period’. I am always apprehensive with a new cleanser, but it didn’t set me off on a roller coaster of skin nightmares for weeks before giving me good skin. The mild formulation of this cleanser meant that my face was happy from day one. I am now on my second bottle of this cleanser. It costs just £11.50 for 200ml in Boots and is very often included in their 342 offers. Great value for such a high quality product. 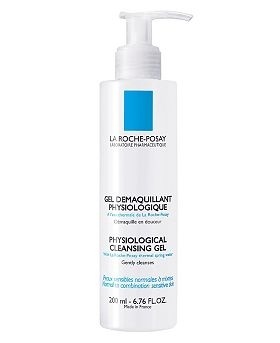 Have you tried any La Roche-Posay products?